As king of England, lord of Ireland, conqueror of the Welsh prince and Scottish king, Edward I in 1305 seemed to contemporaries to have cemented an English royal hegemony over the British Isles, uniting them under his rule. An English poet praised his royal lord ‘our king Edward’, ‘who puts to flight his enemies like a leopard’. The king’s enemies, the Scots and Welsh, were the ‘wolves’ who hoped to tear England apart. Instead Edward had now subdued them to his will and authority. But the expectation that Edward’s authority would create a single hierarchy in which the English nation would define and dominate the British Isles never came to pass. Instead, the 14th century became a crucial period in the history of the British Isles, an era shaped by Edward I of England, by Robert Bruce in Scotland and by Owain Glyn Dwr in Wales and characterised by emerging senses of nation and race. 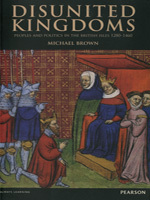 This textbook brings new research and historiography to students of medieval history, and is suitable for undergraduate history students new to the period, and those returning to it.